The U.S. Chamber of Commerce reversed their position on climate change policy this morning, throwing their full support behind Congressional climate legislation. "There is only one sound way to do business: that's to support a strong climate-change bill quickly, so that this December in Copenhagen, President Obama can lead the entire business world in ensuring our long-term prosperity. ... 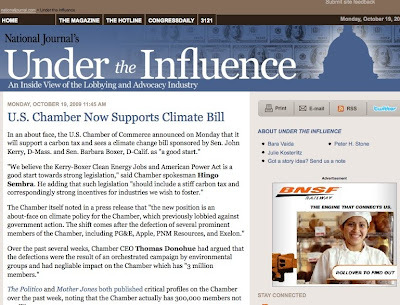 The Kerry-Boxer Bill is a good start to a strong climate bill, and the Chamber will work with Senators Kerry and Boxer to strengthen it"
Does this about face from the previously staunchly anti-climate bill Chamber sound too good to be true? It is. "An actual Chamber spokesman, J.P. Fielder, said the group remains as staunchly opposed as ever to the climate bill," reports a Wall Street Journal blog. Phew, good to know the Chamber remains "staunchly opposed" to any real proposals for Congressional climate legislation. "[Chamber President Tom] Donohue has been vociferous in his opposition “cap and trade” legislation favored by the White House that would make industries pay for carbon emissions. That position has resulted in the defection of big chamber members including Exelon Corp., PNM Resources, Pacific Gas & Electric and Apple Inc. Others, including Xerox, Lockheed Martin and Caterpillar, are under pressure from environmentalists and shareholder activists to do the same." The Chamber quickly blamed the hoax on the infamous pranksters, the Yes Men, before removing the blog post and replacing it with a simple statement that today's announcement, "Is a prank." 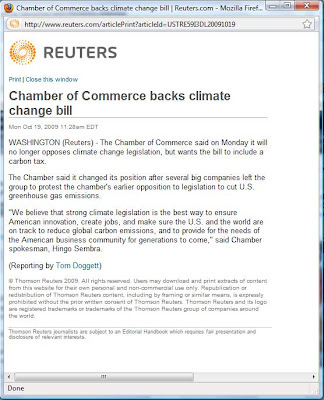 According to the WSJ, the Chamber now claims the fake press release is the latest in "a campaign against the group’s climate stance" by an unnamed "youth environmental group."